Wow ! Each flower can reach up to 15.5 cm in size. Check picutre for the larger image which shown the flower with a lady for scale. Not your average white phalaenopsis. 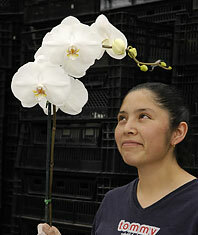 This hybrid will set a new standard for modern white phalaenopsis.